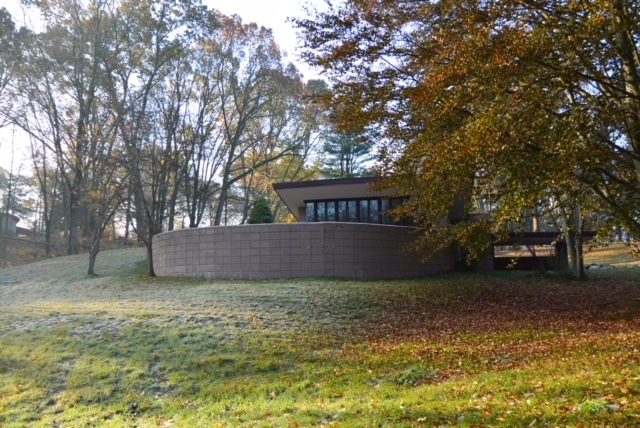 The new owners of the Eppstein House (1948) in Galesburg, Michigan, Marika Broere and Tony Hillebrandt, send word that their restoration project at the Eppstein House, begun in the fall of 2016, has finished in December 2017. The restoration progress and challenges, unexpected issues, sourcing materials, etc. were tracked in the blog Project Eppstein. The textile blocks have been stained with UV protective stain especially designed by Sherwin Williams on our request. For future preservation of the house there is now climate control in all rooms. One bathroom has been updated with tiles that were produced in the 1950s, and mahogany. The plumbing and electricity have all been brought up to standard with the 21st century, with on-demand hot water supply. Two old oil tanks were removed and a large in-ground propane tank was installed. The swimming pool (that was not designed to be with the house) was removed, a new septic tank was installed, french drain systems were installed, concrete floors were restored where necessary, a new roof was installed and ceilings were enforced in some rooms. All the ceilings and outside awnings were painted. A master carpenter has worked continuously in the house to restore or rebuild fixtures, shelves and ledges. 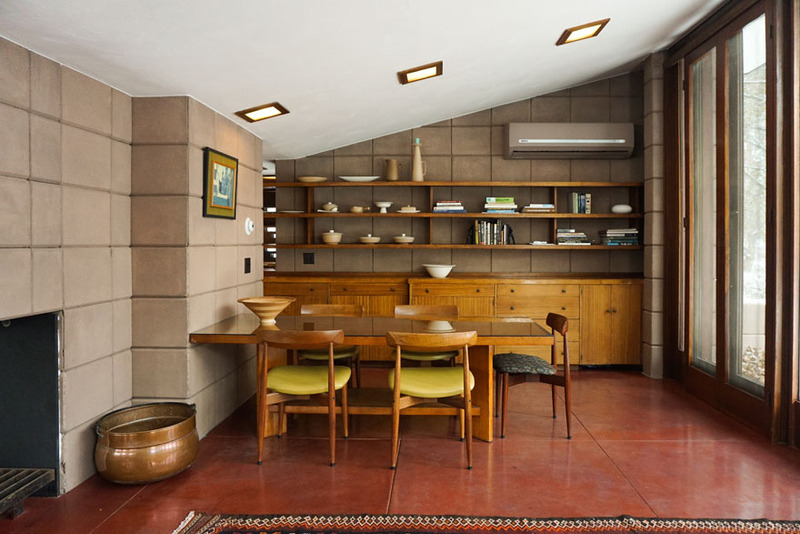 The house is furnished in style, with many Frank Lloyd Wright pieces, one of which the original dining table, and other furniture and art pieces from the same time period. The first guests to stay in the Eppstein House were the children of Dorothy and Samuel Eppstein. To celebrate the finished work, we invited them to use the house. The five siblings, along with some of their partners, children and grandchildren spent the weekend here from Dec 8-10. For some of them it had been decades since they saw the house last. When we met them on the morning of Dec 10, they shared their enthusiasm with us as well as many stories from the past. They also left documentation with us, that they allow us to copy and use, in order to keep an Eppstein history archive in the house. The entire three-bedroom house is available for overnight stays. 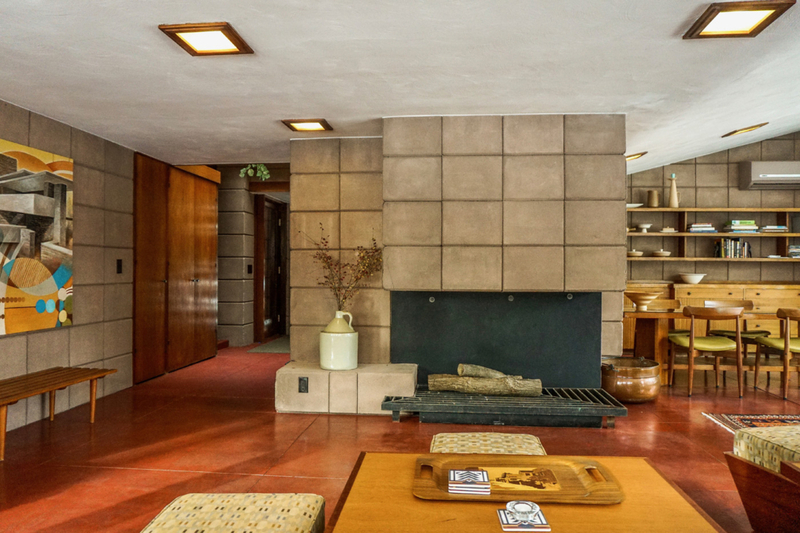 Email us if you have a restoration project (of original Frank Lloyd Wright-designed buildings only) you’d like to share!